David offers over 25 years of experience helping federal, state, and municipal clients solve complex traffic challenges. David, who leads the Public Infrastructure Group, oversees all public sector civil, transportation, and construction services. He specializes in traffic signal design and has overseen the design, optimization, and/or coordination of over 300 traffic signals across the City of Boston — and has led the traffic design of some of the Commonwealth’s most high-profile transportation projects. After graduating from UMass Dartmouth, David was a Transportation Engineer for the Connecticut Department of Transportation. 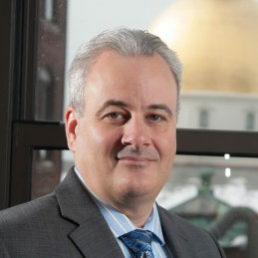 David currently serves as President of New England ITS, and is a member of the Institute of Transportation Engineers and the American Public Works Association.